If you’re contemplating a vegetable garden, choosing the right fertilizer is key. The type you use can really make or break your garden. Without proper fertilizer, all your toiling in the garden goes to waste. If you choose wisely, however, you’re in for a colorful, bountiful harvest. Before anything else, test your soil pH. The key to choosing the right fertilizer is testing the acidity and alkalinity of your soil. In other words, through a check of your soil’s pH! You need to know if it’s lacking certain nutrients or too high in others. The best way to measure pH is by contacting your local cooperative extension or garden center. They’ll give you the tools you need to conduct a soil sample, and after sending it to them, they’ll give you the results. Cost is usually around $30. You’ll receive incredibly helpful data about your soil’s magnesium, phosphorous, calcium and potassium levels, organic matter content, soil chemical conditions, and more. The “perfect” soil pH for a veggie garden usually falls between 6.5 and 7. Lower levels indicate soil with high acidity, while higher means it’s alkaline. This is where fertilizer comes in: the right kind can balance out your soil and provide the best environment for plant growth. Decode the numbers and letters. So many ratios and confusing abbreviations! What does it all mean? If you’re new to gardening, decoding the labels is no easy feat. Fertilizers are marked with three numbers that indicate the percentage by weight of particular nutrients. You might, for example, see a fertilizer labeled “5-10-5.” The first number is the percentage of nitrogen (N), which encourages growth of stems and leaves. The second is the percentage of phosphorous (P205), which is critical for developing healthy roots. The last is the percentage of potassium (K20), essential for flowering, fruit formation, and hardiness. Based on the results of your soil pH test, you’ll have an idea of what ratio is best for your vegetables. Also keep in mind that veggies like cabbage and lettuce benefit from special attention to leaves… so naturally, nitrogen is a priority! Similarly, tomatoes and peppers require a healthy root system, so don’t skimp on the phosphorous! A “complete” fertilizer contains all three of the primary nutrients: nitrogen, phosphorous, and potassium. On the opposite end of the spectrum, a “bone meal” fertilizer, which can work well in veggie gardens, has a ratio of 4-12-0. This means it’s high in phosphorous but provides no potassium. It’s also common to find fertilizers labeled “all purpose.” Typically you can apply these types of fertilizers every 3-4 weeks throughout the season, adding supplemental nutrients to compensate for any deficiencies in spring and fall. Ideal ratios for all-purpose fertilizer are 5-10-10 and 8-12-6.For vegetable gardens in particular, it’s often recommended to apply two pounds of 5-10-10 or 5-10-5 for every 100 feet of row. 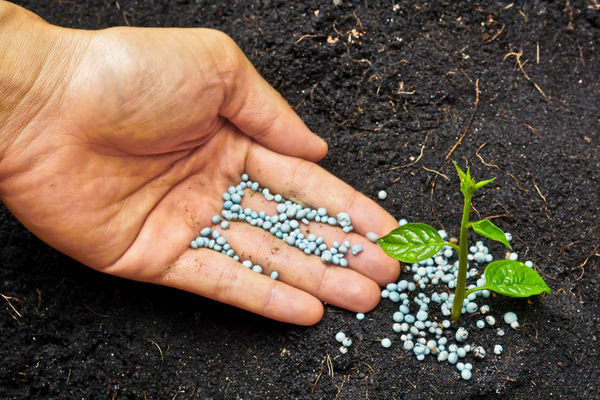 Know the pros & cons of organic vs. chemical fertilizer.Organic fertilizer is composed of materials such as blood meal, fish emulsion, animal and green manure, granite dust and rock phosphate. It comes with plenty of advantages. Organic fertilizer can improve soil structure, fight off diseases, provides a slow and steady diet, and is often cheap or free! On the other hand, if you’re trying to remedy a nutrient deficiency, sometimes organic fertilizers are too slow in their release of nutrients. They’re also lower in nutrients compared to chemical mixtures, and less consistent in the results they produce, which can lead to confusion in just how much to put down.Chemical varieties are synthetically manufactured and widely available. They’re cheap, fast-acting, and come in many different forms. Unfortunately, they deliver no long-term benefits to your soil and contribute zero organic matter. Also, their production necessitates the use of non-renewable resources and leaves a large carbon footprint.